The Blazers will travel to Alabama to play Tuskegee on Dec. 8 at 4 p.m. The 7-0 Blazers are one of, if not, the most athletic teams in the Gulf South Conference, but they want to go much higher. Their plans to become the best show in the GSC will come by splash plays and sending the crowd into a frenzy. At the Complex, that is the norm. 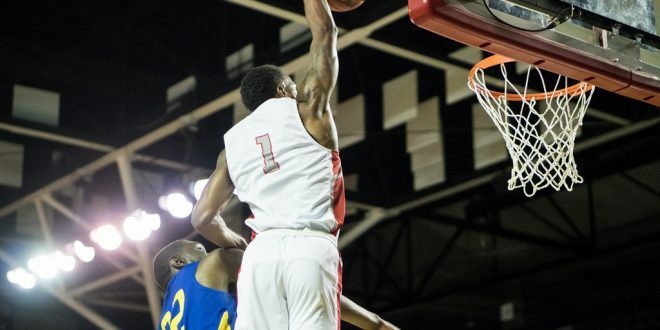 Whether it’s Desmond DeRamus speeding down the floor waiting for the outlet pass or Greg Zuppas grabbing an offensive board, the VSU faithful wants dunks. The Blazers are aware. Getting DeRamus and others running the floor has proven to not be as difficult as the Blazers rank No. 1 in steals with 60. Most of these steals have come from the Guards Beau Justice, Winston Morgan, DeRamus and others picking up their opponents once they have crossed half court. DeRamus leads the team in steals with 12. The takeaways have dialed up for sure. Instantly following defensive rebounds, there are a series of passes before the ball enters the hoop. Head Coach Mike Helfer draws up plays to give his guys chances to display their athletic gifts. Against Union on Nov. 29, Morgan ran a play in the third quarter, specifically intended for Zuppas. A total of three screens were set on the play, giving Zuppas a bit of an air time meeting with the basket. Morgan connects on the pass to Zuppas up high, but the ball was too far behind him to pull in for the alley-oop. Justice smiled and Guillozet let off a small chuckle knowing that Zuppas can sink the monstrous dunk. Whether it’s a make or miss, they smile and keep playing the game they all love.